It’s time to gaze into our crystal ball and see what the coming year has in store for science. From powerful new rockets and asteroid-sampling spacecraft to groundbreaking particle physics, there’s plenty to look forward to in 2018. In March 2018, NASA will launch its Transiting Exoplanet Survey Satellite (TESS)—a mission to find previously undiscovered exoplanets from the vantage point of low Earth orbit. The space-based telescope is expected to discover thousands of exoplanets over the next several years as it measures the luminosity of more than 200,000 stars, hoping to catch signs of distant planets in their orbits. NASA will also launch its InSight probe, which is scheduled to go up in May. InSight should land on the surface of Mars in November, where it will deploy its various instruments to probe the interior of the Red Planet. It’ll also attempt to take the planet’s temperature and detect signs of seismological activity. The overall aim of the mission is to gain a better understanding the processes behind planet formation. A joint effort between the European and Japanese space agencies, called BepiColombo, will see a spacecraft launched towards Mercury in November. After it arrives in late 2025, the craft will deploy a pair of orbiters: the Mercury Planetary Orbiter (MPO) and the Mercury Magnetosphere Orbiter (MMO). Both satellites will have to endure temperatures exceeding 350 degrees Celsius as they observe the planet closest to the Sun. The coming year will see not one, but two asteroid-sampling missions. Japan’s Hayabusa 2 and NASA’s OSIRIS-REx, will reach their respective targets in July and August. Hayabusa 2 was launched in late 2014, and it’s expected to return with a sample taken from asteroid Ryugu in December 2020. OSIRIS-REx will be visiting asteroid Bennu—a rock that measures nearly a half-kilometer in width and is listed as a potential Earth impactor. It currently has the third-highest rating on the Palermo Technical Impact Hazard Scale, with a 1 in 2,700 chance of hitting the Earth in the late 22nd century. OSIRIS-REx will return its samples to Earth in 2023. 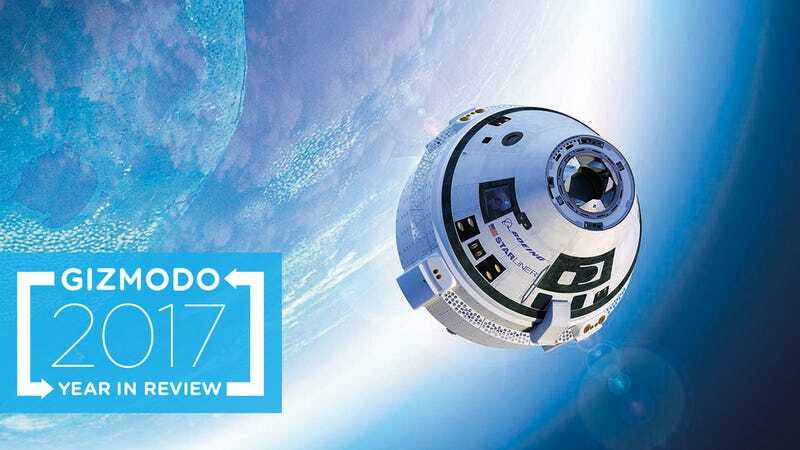 If all goes well, we’ll witness the first crewed mission of Boeing’s CST-100 Starliner in 2018. This space module is being developed in collaboration with NASA’s Commercial Crew Program. It will accommodate seven passengers, or a combination of crew and cargo, for missions to low Earth orbit. The futuristic-looking craft features a weldless structure, and will be reusable up to 10 times with a six-month-turnaround launch period. Starliner will also be equipped with wireless internet and tablet technology for the crew. The successful deployment of Starliner will mean that the U.S. will have finally regained its ability to send astronauts into space—something the nation hasn’t been able to do since the retirement of the Space Shuttle program in 2011. In 2018, China will once again attempt to land a rover on the Moon (China declared its first attempt in 2014 a success, but it was actually quite a mess). Late in the year, the Chang’e 4 rover will visit the surface of the far side of the Moon, where it will study geological conditions. In June, China will launch a communication relay satellite in anticipation of this mission, which will be used to bounce signals from the rover to the Earth. It will mark the first-ever landing of a lunar rover on the Moon’s elusive dark side. China will also launch its core module Tiahne-1— the first of three large modules that will comprise the Chinese Space Station. Meaning “Heavenly Harmony,” the core module will be the backbone of the station, providing the main living quarters and control center for the taikonauts. In January, if all goes according to plan, SpaceX will see the inaugural launch of its Falcon Heavy rocket—a vehicle with the capacity to lift large cargos to Earth’s low orbit and beyond. Once this powerful, reusable rocket becomes operational, SpaceX will be able to boast that it offers the largest payload capacity to low Earth orbit of any company. The coming year could also see the first crewed mission of the SpaceX Dragon 2 capsule. The current plan is to deliver astronauts to the International Space Station, which is expected to happen in May 2018. Don’t be surprised if this gets pushed back. And in late 2018, SpaceX aims to send a pair of space tourists on a trajectory that will see them swing around the Moon and back again. They’ll fly aboard a Dragon 2 capsule propelled from Earth’s gravity atop a Falcon Heavy rocket. If this actually happens, it’ll be the first time that humans have traveled farther than low Earth orbit since the last Apollo mission. If we’re lucky, 2018 could produce our first glimpse of a black hole, specifically the supermassive black hole Sagittarius A* that’s located 26,000 light-years away in the center of the Milky Way galaxy. Obviously, there’s more to snapping a photo of a black hole than putting a camera on the end of a telescope and hoping for the best. Black holes are called black holes for a reason, so the best that astronomers can hope for is to capture a glimpse of its “shadow,” or rim, around the event horizon. Astronomers will need some extremely high-resolution telescopy to pull off this feat, and the key is a technique known as Very-Long-Baseline Interferometry (VLBI), which combines the observing power and data gathering capabilities of multiple telescopes around the world. Earlier this year, Sagittarius A* was scanned by the Event Horizon Telescope (EHT) and the Global mm-VLBI Array (GMVA) projects. New results are expected in early 2018, so hopefully we’ll have some exciting new images to share. In April, the Gaia collaboration will release its second dataset, which is expected to include parallaxes (the position and direction of objects when viewed from different positions) and proper motions for about a billion stars. The dataset will also include photometric data for a sample of variable stars, and data pertaining to a preselected list of about 10,000 asteroids. The aim of the Gaia project is to chart a three-dimensional map of the Milky Way galaxy, and by doing so, provide additional details about its composition, formation, and evolution. Sadly, the coming year won’t produce a spectacular total solar eclipse like the one in 2017, but there are some celestial events of interest. There are two total lunar eclipses of note, one on January 31 (visible over parts of northwestern North America, the Pacific, Asia, and Australia) and one on July 27 (completely visible over Western Africa, and Central Asia, seen rising over South America, Eastern Africa, and Europe, and setting over Eastern Asia, and Australia). A total lunar eclipse happens when the Moon passes within Earth’s umbra, or shadow. Basically, it’s when Earth casts a gigantic shadow across the face of the Moon. And on July 31, Mars will make its closest approach to Earth since 2003. Two experiments could enhance our understanding of dark matter in the coming year: the XENON experiment and China’s Particle and Astrophysical Xenon Detector, or PandaX. The hunt for this elusive, tiny particle hasn’t been easy, leading to some radical solutions. XENON uses giant vats of liquid xenon (an element that’s normally gas at room temperature), while PandaX is looking for signs of WIMPS, or Weakly Interacting Massive Particles, within the deepest lab in the world. WIMPs are hypothetical elementary particles that comprise mysterious dark matter. Each year brings new hope of new discoveries about dark matter, with 2018 being no exception. CERN’s Large Hadron Collider (LHCb) will continue to churn away in 2018, investigating what happened in immediate aftermath of the Big Bang. Scientists are still trying to figure out what the conditions were like in these early seconds, minutes, and days, such that matter was able to survive and the universe able to take shape. We’ve already had some tantalizing results—like the 2.5 sigma bump that scientists are still investigating—and hopefully we’ll have more bumps in 2018. On a related noted, particle physicists will use the Belle II experiment in 2018 start to study properties of B meson particles. This machine is a revved up version of Belle I, and it expected to collect around 50 times more data than its predecessor. The project will hopefully find new physics beyond the Standard Model, a list of rules that have helped shape our understanding of the most fundamental building blocks of our universe, but leaves gaps in our knowledge of things like dark matter and where all the universe’s missing antimatter has gone. But next year, Google plans to hit a major quantum computing milestone called “quantum advantage” or “quantum supremacy.” This will be the first quantum computer to solve a problem faster than a classical computer, in its simplest terms. That doesn’t mean the computer will be useful. The problem will be specially formulated to demonstrate this milestone. But quantum computers are still a few years away from having enough quantum bits, or “qubits,” to solve problems useful for the industry, and decades from breaking public key encryption. Instead, this supremacy problem will be more like a benchmark to compare future quantum computers.